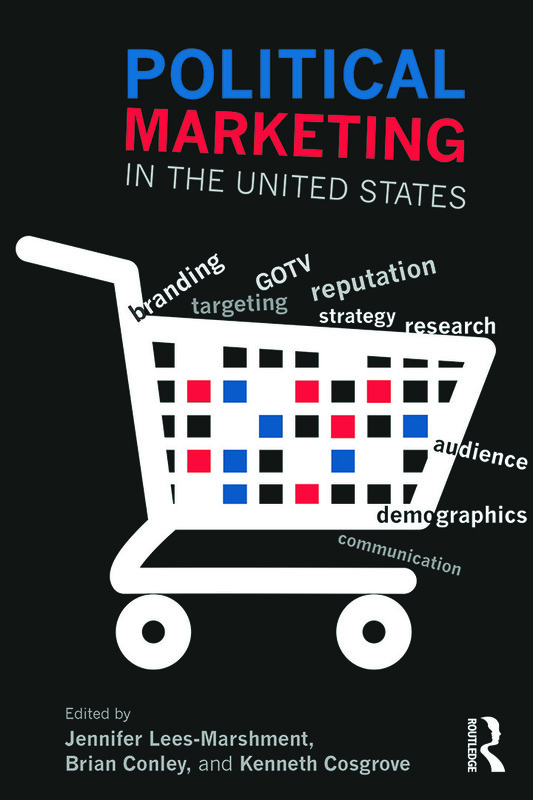 "Lees-Marshment, Conley, and Cosgrove have made an enormous contribution to our understanding of political marketing, not just by bringing together prominent scholars all addressing an emerging and critical trend in American politics, but by offering us a coherent definition of how marketing in politics differs from mere campaign communications." Foreword; Dennis Johnson. 1. Marketing US politics; Jennifer Lees-Marshment, Brian Conley and Kenneth Cosgrove. 2. The emergence of voter targeting: learning to send the right message to the right voters; Michael John Burton and Tasha Miracle. 3. Database political marketing in campaigning and government; Lisa Spiller and Jeff Bergner. 4. Boutique populism: The emergence of the Tea Party movement in the age of digital politics; André Turcotte and Vincent Raynauld. 5. Primary elections and US political marketing; Neil Bendle and Mihaela-Alina Nastasoiu. 6. Branding the Tea Party: political marketing and an American social movement; William J. Miller. 7. Access Hollywood: celebrity endorsements in American politics; Alex Marland and Mireille Lalancett. 8. Personal political branding at state level; Kenneth Cosgrove. 9. Brand management and relationship marketing in online environments; Darren G. Lilleker and Nigel Jackson. 10. Relationship marketing in social media practice: perspectives, limitations and potential; Christine B. Williams and Girish J. "Jeff" Gulati. 11. Mama Grizzlies: Republican female candidates and the political marketing dilemma; Robert Busby. 12. The market research, testing and targeting behind American political advertising; Travis N. Ridout. 13. Crisis-management, marketing, and money in U.S. campaigns; R. Sam Garrett. 14. Communicating contemporary leadership in government: Barack Obama; Edward Elder. 15. Does Obama care? : assessing the delivery of health reform in the United States; Brian Conley. 16. US political marketing trends and implications; Jennifer Lees-Marshment, Brian Conley and Kenneth Cosgrove. Jennifer Lees-Marshment is an international expert in political marketing at the University of Auckland, New Zealand. Her books include The Routledge Handbook of Political Marketing (Routledge 2012), Political Marketing: principles and applications (Routledge 2009), Global Political Marketing (Routledge 2010), The Political Marketing Game (Palgrave Macmillan 2011) and Political Marketing in Canada (UBC, 2012).See www.lees-marshment.org for further details. Brian Conley is an Assistant Professor of Government at Suffolk University in Boston, MA. His principal research interests are in the areas of US electoral politics, political parties, and political marketing and branding. Kenneth Cosgrove is Associate Professor of Government at Suffolk University in Boston, MA. He is the author of Branded Conservatives: How the Brand Brought the American Right From the Fringes to the Center of American Politics. His research interests center on political marketing with a focus on branding in North American politics.